Mary's breakthrough method, The Revolutionary Send, connects 5 elements of voice technique with 5 elements of the emotional life. Learn Mary's secrets to bring your voice to its' true potential. Whether you've studied with Mary before or this is your first time singing with Mary, she will bring you to your next level. Singers, actors and dancers will benefit professionally..
After registering, click on STUDIO and drop down to WORKSHOPS. 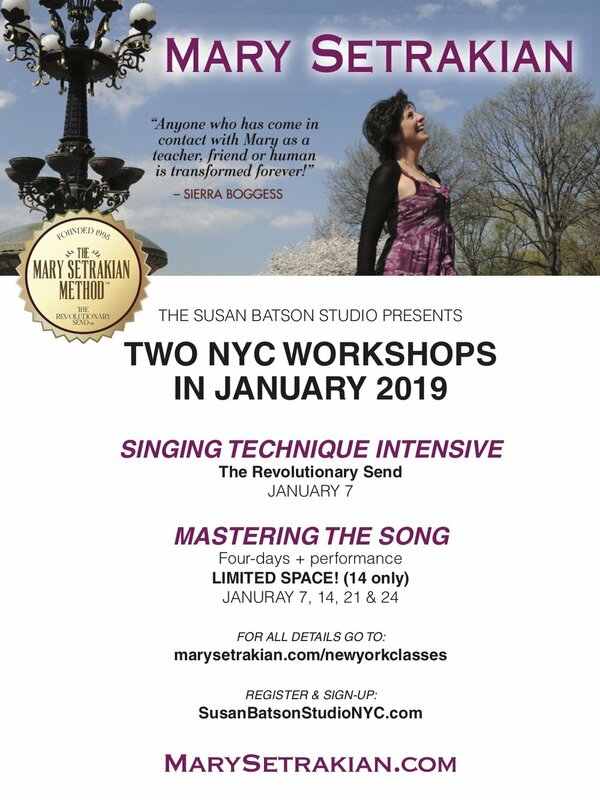 Find SINGING TECHNIQUE INTENSIVE on January 7th & click on BOOK HERE. The Script Analysis with Susan Batson’s Breakdown method is paramount for all actors. Now you can take advantage of this dynamic information with songs! Join Mary to learn this exciting process that will set you apart from all the rest! Students will choose their own individual song and work on it with Mary and the pianist in front of the class. The first half of class students will do a final run-through of their individual songs. The open Masterclass Performance will start at 7:30 pm for invited family and friends. The fabulous Susan Campanaro will Emcee the evening as “Lavinia Draper” making it a special night. Open Feedback for students with our audience will be the last hour 8:30 - 9:30 pm. The $350 balance is to be paid by the start of the workshop. If you are unable to attend after reserving your spot ($100) you must call to cancel. You will receive a $100 credit to your account available for any class or workshop at SBS in the future. The Susan Batson Studio has a no refund policy. As a master voice teacher, Mary prepared Nicole Kidman for her Golden Globe Award winning and Oscar nominated performance in her first musical, Moulin Rouge. Mary most recently was called upon by the JC Superstar Live team to help English actor, Ben Daniels, make is singing debut as Pontius Pilate on NBC starring John Legend. Mary is internationally known, teaching in Italy, England, Portugal, Russia, Australia and Armenia. Mary's voice students include Mary J. Blige, Kerry Washington, Kate Winslet, James Gandolfini, Juliette Binoche, Sierra Boggess, Bella Thorne, Milla Jovovich, Trudie Styler, Aida Turturro, Debra Cox, Keri Russell, Tate Donovan, Micky Dolenz, Simone, Patrick Cassidy, Bobby Cannavale, Charles Osgood and Italian stars Serena Autieri, FIlippo Timi, Marco Ligabue and rapper Baby K.